"We look at need instead of supply and so we miss God’s goodness. And then we degenerate morally, spiritually, and emotionally." A book for those meeting God for the first time or needing Him desperately in a time of difficulty or suffering. There is perhaps no greater spiritual stumbling block for believers and the unsaved alike than that of God’s Sovereignty. If God is truly Sovereign, then He can halt the move of evil and prevent our suffering…so why doesn’t He? What is the purpose of the pain and suffering in our lives? Where is God in this broken world? Who is He really? How can a good God allow suffering? In All and Only, Martha Kilpatrick looks at some of the greatest men and women of the Bible—and the great suffering that marked their lives. Esther was a young virgin captured into the harem of one of history’s cruelest kings. Joseph was betrayed by his own brothers, sold into slavery, and later thrown into prison for years. David was anointed by God and then spent years hiding in caves and running for his life as he was hunted by Saul. Esther, Joseph and David were marked by God’s favor, yet they suffered enormously. Why? All and Only doesn’t flinch from the issue of suffering. Instead it follows that suffering into the hidden treasure trove that few will find. Kilpatrick searches for the true nature, the very Father-heart of our Sovereign God, in the suffering that He allowed, and what she finds is astonishing. 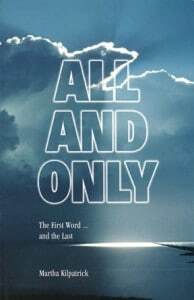 All and Only introduces the reader to God as GOD and invites them to seek out the higher purpose and ultimate destiny in their own lives by pursuing the Love over it all. All and Only is now available in both print and digital format. The enigma of suffering. The perpetual question is a challenge not only to the power of God but to His very nature: How can a good God allow suffering? One who has the power to do anything at anytime…that One is sovereign. Even if He doesn’t use that power. To withhold power is still to possess it. There is an explanation and it lies with a benevolent Creator as His sensible secret… That is enough. The lusting mind gropes for explanation… “I will trust if I can only understand.” By asking the question we are demanding that God win, not only our approval, but our consent. We must authorize His actions. But God is not a God who stoops to get permission for His actions. When the terrible-what-happens occurs, our hold on His absolute dominion is attacked, and our hope is enfeebled that He is good, greatly good. And what we really believe comes snarling out. I asked a missionary candidate, “Does your school teach that God is sovereign?” “Oh, yes, God is all-powerful.” Powerful we all agree. But sovereign? Sovereign is not the same as powerful. Powerful could…if it would. Sovereign IS. God identified Himself to Moses as…I AM. What a strange way to say it. Nothing unsaid… in the most amazing self-disclosure God had said it all. God will Sovereignly accomplish what He asks of you. All by Himself. A man must be called. He doesn’t choose his place in God’s chronicles nor the timing of it. The pathways of his story also are mapped out…by God, not himself. Abraham, singled out by God, chosen among heathen idolaters to know and follow I AM. To know by following… He was elected to a place, a time, and a particular demonstration of God. And so are you. He was selected to father nations but God made sure that it was humanly impossible, divinely improbable. Long before God performed this, He spoke it. He is God over All, Only Ruler and Controller. When He speaks, the very universe heaves to accomplish it. Natural laws collapse before the sound of His Transcendent Voice. Human wills spend their fight, then bow. His resounding Word breaks and creates, makes and separates. And nothing holds it back, not even humanity’s bungling stupidity. By the bitter education of error, Abraham learned that when God spoke, it was sovereignly accomplished. How could Sovereignty speak and it NOT come to pass? But it takes a while to see…God as God. To discover that what He promises only He can deliver. God never asked for Abraham’s help, only his surrender… But because he thought God needed assistance, Abraham had long years to eat the acrid fruit of forcing God’s promise into existence before it was ripe. His putrid creation of God’s Idea sapped him to the last ounce of hope. Drained his marriage, too. Abraham eventually learned to pray instead of perform. To wait rather than run – see God and not himself. And most of all, he discovered how to receive: To receive the all-encompassing blessing of God…without deserving it. To relinquish what he loved most, to receive it back alive from divinely-ordered death. To accept without protest his frightening inadequacy, either to effect God’s will or even to keep from trying to do so! Isaac was conceived when the man was destitute of trying to support God’s plan, by the collapse of his own prowess, and was left with nothing but…stark faith in the Only One Who has power. When a man is reduced to the embarrassing level of simple receiving, then God’s promise has no obstacle of fulfillment…no strutting man to take credit for what God did all by Himself. But no one will ever volunteer to live by the dire vulnerability of receiving. It’s too, too naked. He must be shamed into it by the hopelessness of every other possibility. He must be disabled out of his determination to fulfill a vision he did not originate. Weakness is man’s final invitation for which God unendingly waits. A man can face suffering only if he wrings it out in naked honesty with God…not man, not Satan. Satan asked for Job. I AM, the Protecting Force, agreed. Why would I AM do such a thing? Job’s friends knew why. Some dark and secret crime was surely in Job, who deserved his suffering or he wouldn’t be suffering. God, displeased with friends who dealt in proud whys, in human explanations of divine inexplicables…never justified Himself. It was not an issue of sowing-and-reaping, of justice, of cause-and-effect. It was simply God’s choice for Job. When you are God, you don’t owe anyone an explanation of Yourself. Not anyone. Those questions, those terrible questions showed Job the gap between his intellect and God’s. He shriveled from this recognition and…saw God, really saw WHO HE IS for the first time. Job’s friends live on…forever finding imagined whys in the story. “It was Job’s pride,” but God Himself had said there was no flaw in the man. We will have our answers, even if we have to make them up. Job’s friends are ever lustfully unsatisfied with mysteries. God’s final answer to the matter was, “I AM (and that means sovereign). That’s all I have to say.” Read the book backward. Read it forward, it still comes out that God simply said I AM WHO I AM. Job was introduced to a Tremendous God. His God was so little that He could only bless Job out of blessing. Job didn’t know he needed a God who was big enough to bless him out of great catastrophe. Job’s fear was that I AM was not able to protect him, and his world. Job’s God wasn’t absolute. And God loved Job enough to magnify Himself before the man. When Job suffered and blessings went, God’s character came into question. So it is with us. In talking about the most frightening creature on earth, God argued for His supremacy, having made that creature. Job’s fear in life, of life, was keeping him from a higher worship. God didn’t consider his fear a condemnable wrong, merely human ignorance, and so God resolved his fear, called him to fear only…the Sovereign One. Many know Him as Forgiveness, some know Him as Love, Truth, so on. But few know God as…God. Who took my mother? Was it God? Oh, no, God is good…couldn’t have been God. My mother’s death was so bad for me. But God is ultimately in control. Or is He? Satan’s evil force? Yes. No doubt. Was it God’s will? How could it be? Or was it her fault? It had been a long and sweating question…with no solution. When finally He pulled that “why” from its dark musing place, He answered. But notice please, He didn’t explain. So I thanked Him for that which had wrecked me, for what I had resisted for years. Somehow it was easy. Still no explanation why. Just that it was good, for my good, because He is good. deeply satisfied. I hadn’t needed to know “why” after all. I had needed to know if God was irrevocably in charge. If I was really vulnerable to life and evil…to anything that would want to harm me. If as a sheltered, rather helpless youngster, my world could almost overnight be ruined, then it must follow that anything might happen, any horrible prospect was a possibility. Did I have any protection? Any security? My moorings had been shaken. An explanation of why it had happened would not have answered my real need: the need to know if life could shake me unmercifully while God watched in indifference or worse still, helplessness. The answer was I AM. And that was what I most needed to know. He WAS God. He really was. A God, not a Judging Observer, but a Very Present Force. I walked out of the buried sickness my lonely “why” had caused. For it was not her death that made my agony, nor did any related suffering…but my failure to comprehend the God above and behind it all. My deep question was not really of events (as I imagined) but of His Innate Goodness and His Overriding Power. After all the errors of man and their consequences, after all obvious evil has had its way, was God still God? Did He have the final say? I saw that His Goodness and His Power were so vast that no evil, no suffering has any power to harm me in His realm. All disaster is swallowed up in His supremacy and becomes not just benign, but beneficial! The problem was not the suffering; it was my separation from God while I was in it. As soon as I dug it up and put it inside His Sovereignty, the pain was gone. When one has no longer any pain in suffering, what matters the suffering? The transformation of those beliefs about Who He IS made me whole, and I saw in my daily living, the proof of it. Giddy, incredulous, I knew that God had given me the key to the healing of man’s inner pain. I sensed I had touched, not just my own solution, but an eternal cure. An audacious claim for sure! But one of which I was, and would remain, absolutely certain. A truth that was crystal clear and undeniable in His Word. The key – a single belief and a simple response, based on scripture: God is sovereign. I thank Him. For God is… and He is God! God is great, God is good – little children know. Adults have had that knowledge destroyed. “There is only one good”… That excludes every other appearance of good. In fact, according to that statement, there is no good except God. All that man produces is not good. The noble acts, the heroic deeds, the generous behavior – all the good of man – is not good. Not true good. His goodness is incomprehensible to us. And the enemy’s favorite device is to cruelly blind us as to that goodness…to present proof it doesn’t exist and leave us in the fearful dilemma of that. “Holy” isn’t usually in question concerning God. Holy we can buy. But good, really good, ah, that is another matter. God’s goodness is vindicated by His restoration not only of Job, but of Job’s recalcitrant friends who received God’s high disapproval. His goodness is seen in His divine plan for Joseph. He was all along, in secret design, preparing him for good, even splendid things: the rulership of Egypt and the salvation of his people, the very ones who caused him such unjust suffering. God was even good to those treacherous brothers! God always has His plans: exciting, splendid orders for the future. To Daniel He gave the unimaginable rulership of his captor’s nation! And more than that, to Daniel He gave a place of significance in all human ages and throughout eternity. Abraham, He made rich in the very incident of his disloyalty to Sarah…made rich by the king to whom his lie caused great suffering. God’s goodness knows no limits except those we create. God can bless the one who knows He is God and doesn’t object. But most poignant and most inscrutable is the offering of His own Son to hideous suffering. Why? So that He could freely bestow His goodness on mankind who deserved only His wrath. We can never take it in. Rarely is even one of us able to approach receiving it. We weigh His goodness by our standard: by the sensual, by peace or happiness, by the things He gives. And by that external we judge Him. We have no real vision of His vast good, His complete goodness. He has not withheld one thing from us, and even beyond what we need – He has given everything He has, even to the rulership of the world, a throne with His Son! Do you understand? He has withheld nothing from us! The problem is never, ever with God. The problem only is in our receptiveness. We buy the ancient lie: God is not good, as proven by what He has withheld. So we banish our bitter selves from His lavishness. We hold onto our transgressions by failure of admission, and when we don’t experience His outpouring, we say He isn’t outpouring. In our proud destitution, we would rather die than need Him. And in our insane independence, we would rather fail than give Him the credit for our victory. The beggarly alone find themselves in the wondrous kingdom.